A Certified Nursing Assistant provides treatment and direct care services to sick, disabled and terminally ill patients under the guidance of a registered nurse or licensed vocational nurse. The role involves transferring and transporting patients, measuring and recording vital signs, cleaning patients’ rooms, and assisting with the activities of daily living. 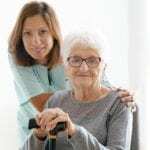 While the majority of CNAs work in long-term care facilities and hospitals, there’s a growing need for direct care services in the home especially as it becomes more cost effective to treat chronically ill patients in the comfort of their homes. According to the Bureau of Labor Statistics, employment of nursing assistants and orderlies will grow faster than other occupations through the year 2020 in response to the growing needs of the elderly population. In Florida, any individual 18 years or older may take the state exam – with or without formal nurse assistant training. Training covers the core study areas in preparation for the written and skills evaluation. Therefore, students who enroll in a CNA class will increase their chances of success. Many CNAs pursue further education that leads to certification as licensed practical nurses or registered nurses. ASI’s CNA program provides students with the theoretical and clinical knowledge and skills to execute their responsibilities and functions as entry-level employees in acute and long-term health care. The course topics include communication, vital signs, positioning and transfers, personal care, physical and psychosocial needs, patients’ independence and rights. Instructors emphasize working with the elderly in long-term care and help students develop an awareness of patient safety and report instances of abuse. Students also learn to work under the guidance of registered nurses, licensed practical nurses, and other licensed healthcare professionals. After completing the didactic requirements of the training, students participate in a supervised practical experience at a skilled nursing facility. Graduates will receive a certificate of completion and will be prepared to take the Florida nurse aide evaluation for state licensure. Compu-Med Vocational Careers nursing assistant training is specifically designed for Spanish-speaking students. The 120-hour class comprises of classroom instruction, a hands-on demonstration in a simulated lab, and clinical experience in a long-term care facility. The course takes students through the skills that will improve their success on the skills test for Florida certification. Applicants must be 18 years or older with a valid state ID – no high school diploma or background check required. The following are some other Florida Board-approved institutions that provide nurse assistant training in Hialeah, FL.